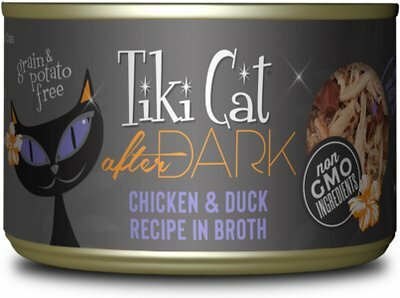 Your little carnivore craves meat when the lights go down―and pretty much any other time―so give him the meaty nutrition of the Tiki Cat After Dark Chicken & Duck Canned Cat Food. 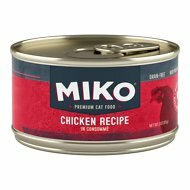 It’s formulated with chicken, chicken liver, chicken gizzard, chicken heart and duck, simmered in whisker-licking real chicken broth. Since it’s made with actual broth, it provides plenty of moisture to keep your pal hydrated and support digestive and urinary health. And it’s packed with essential vitamins, omegas, minerals and taurine so it’s a complete and balanced diet for cats of all ages, with zero grains, starches or flours and low in carbohydrates. Chicken, chicken liver, chicken gizzard, chicken heart and duck are the top ingredients for animal-sourced protein to meet the needs of carnivores. High protein to support healthy muscles to keep your pal active, whether he loves the indoors or outdoors. Provides a balanced and complete diet for cats of all ages with essential amino acids, antioxidants, vitamins, minerals and taurine. 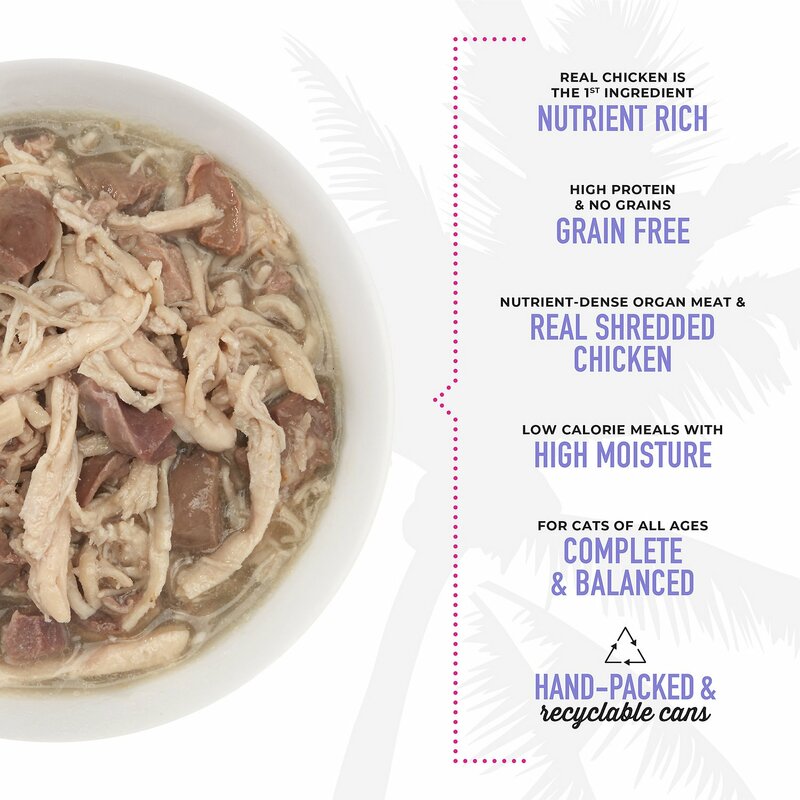 Made with real chicken broth so it provides essential moisture to keep your pal hydrated and support overall health. Succulent and meaty low-carb formula is great for picky eaters, and contains no grains, starches or flours. Chicken Broth, Chicken, Chicken Liver, Chicken Gizzard, Chicken Heart, Duck, Tricalcium Phosphate, Potassium Chloride, Choline Chloride, Magnesium Sulfate, Salt, Taurine, Zinc Amino Acid Chelate, Iron Amino Acid Chelate, Vitamin E Supplement, Tuna Oil, Ascorbic Acid (Source Of Vitamin C), Thiamine Mononitrate (Vitamin B1), Niacin (Vitamin B3), Manganese Amino Acid Chelate, Vitamin A Supplement, Copper Amino Acid Chelate, Calcium Iodate, Calcium Pantothenate, Sodium Selenite, Riboflavin Supplement (Vitamin B2), Vitamin B12 Supplement, Pyridoxine Hydrochloride (Vitamin B6), Folic Acid, Vitamin D3 Supplement, Biotin, Vitamin K3 Supplement. 2.8 oz Can: 3 cans per day for 7 lb. Adult cats. 5.5 oz Can: 2 cans per day for 7 lb. Adult cats. Varies based on age, activity, lifestyle. Serve at room temperature. Refrigerate after opening. 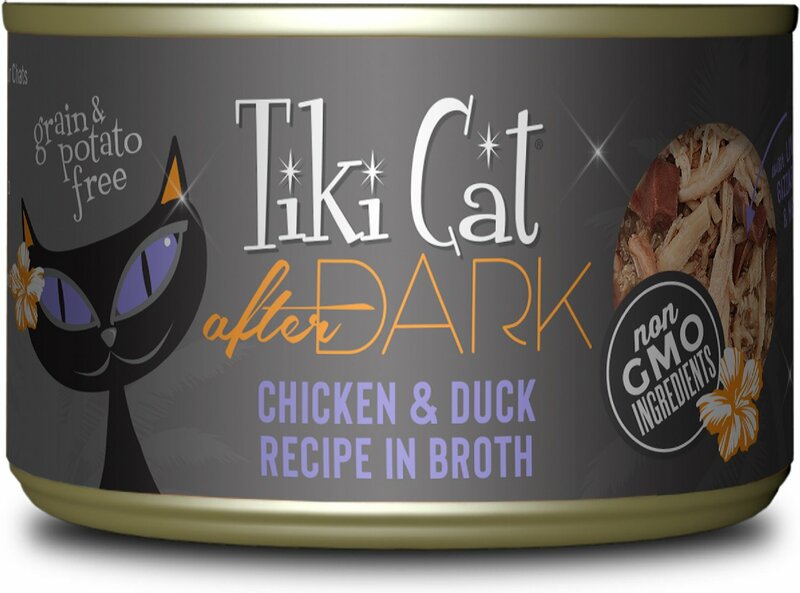 Begin the transition by mixing both current food and Tiki cat food together. Gradually decrease the amount of the current cat food while increasing the amount of new Tiki cat food. Continue to do this over a 7 day period. 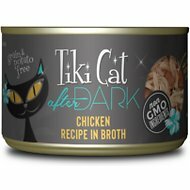 Tiki Cat believes that cats, born obligate carnivores, need a high-protein, high-fat and low-carbohydrate diet to be their best. 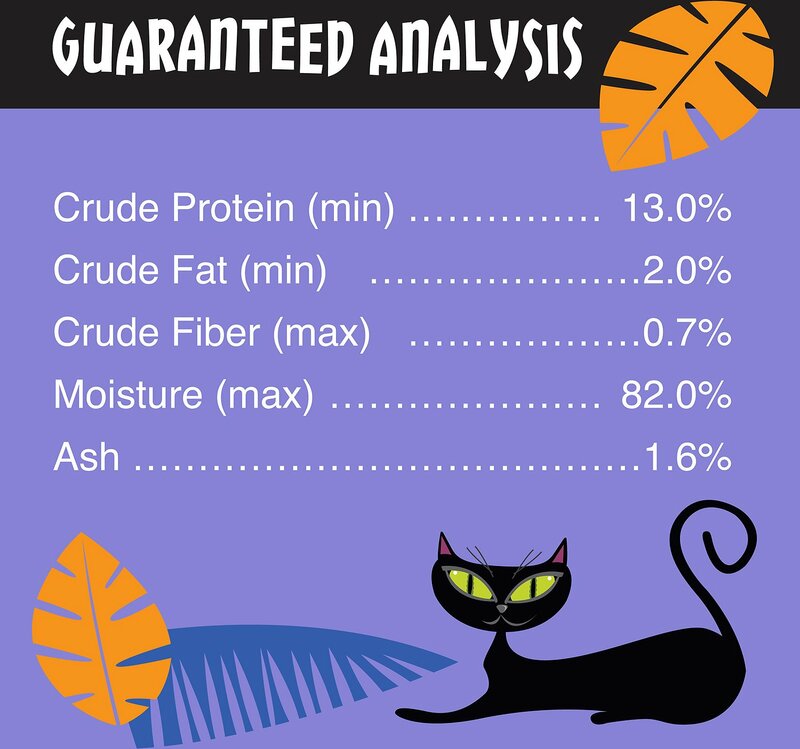 So, they created their meals with your cat's ancestral needs in mind—featuring high-quality proteins, ingredients you can trust and a wide variety of tasty options. With Tiki Cat, you can feed your cat the way she was born to eat. 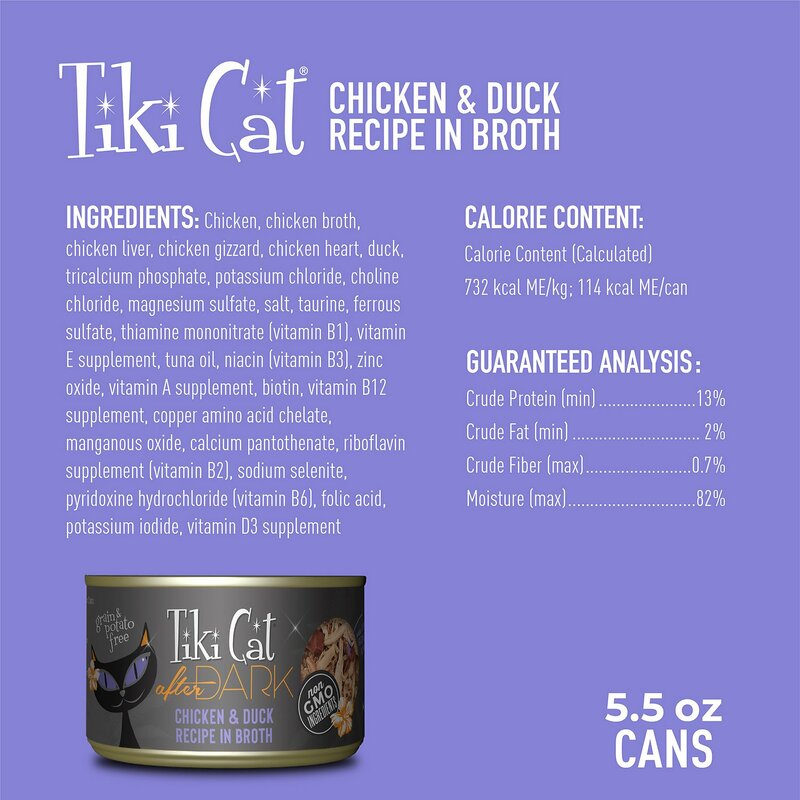 Designed to fuel feline pursuits, Tiki Cat's recipes emphasize protein and only use high-quality ingredients in every batch. 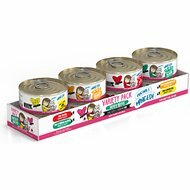 Packed with nutrient-dense protein sources including organ meat, lamb, whole shrimp and shredded chicken, you can trust that your kitty is eating a delicious meal that nourishes her whole body. The ingredients in Tiki Cat may look familiar. And they should! Made without grain, potatoes, corn, rice or wheat, Tiki Cat meals are packed with ingredients you know and love—and your kitty is sure to love them too. Plus, they're high in moisture, to give your cat the additional water they need to thrive. With so many assorted flavors and a range of textures, even the pickiest of cats will discover a favorite. Choose between crunchy, baked dry food and smooth, soft wet food—or mix and match with both—to find the right flavor for your kitty. It's that easy to make the meal of your pal's dreams. There's something for everyone, and enough variety to make mealtime a surprise each day. With a passion for nutrition, Tiki Pets set out to create healthy and delicious pet foods that are made using only high-quality, all-natural ingredients and none of the junk. They believe that real ingredients are essential for dogs and cats, which is why all their formulations feature high-quality animal protein sources as the first ingredient. 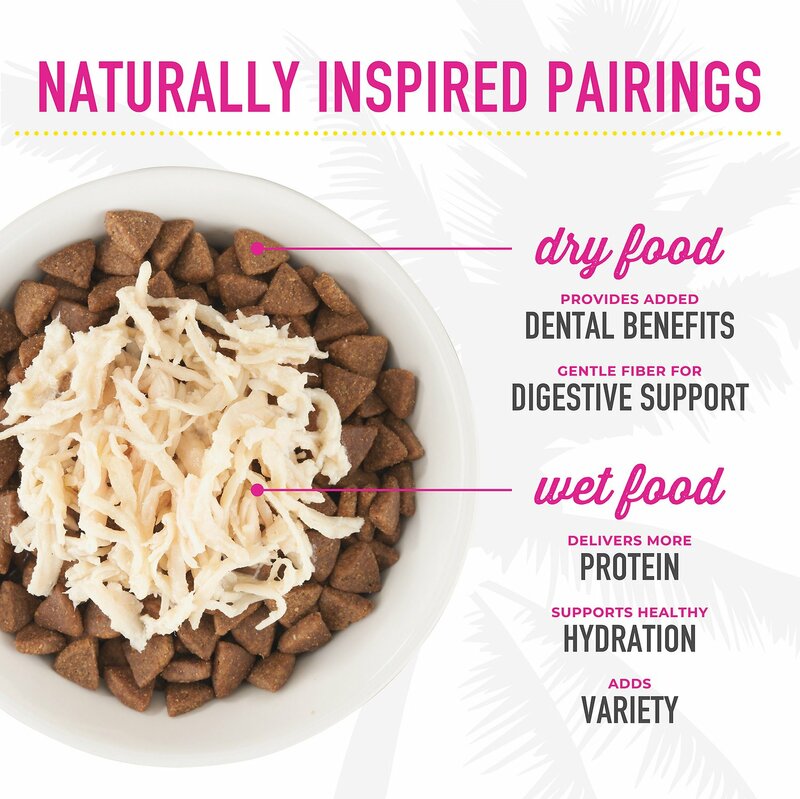 And with such a wide variety of flavors and textures to choose from—and mix and match between—you can be sure to find the right combination for your cat or petite dog. I agree with the reviewers that wish there was more meat in the can but I also appreciate the liquid because my cats don’t drink enough and they love this broth. My cats love the taste of the meat and you can see the real ingredients of shredded meat and minced organ meat. There’s no hidden fillers. Other than it being expensive for the amount, I’m a fan. Usually my cat licks up the moisture and leaves the chunks. Not with this one - devoured it. Since it's on the expensive side - it's an occasional treat. I feed raw food mostly and supplement. This food is great. He loves it ad has plenty of moisture. My male cats love this flavor! My female is more hesitant, though she will eat it. It seems more watery than other flavors of Tiki Cat that I have purchased but that's not a bad thing because I feel like cats definitely need more sources of fluids. It was kind of gross seeing what definitely appeared as an organ part in a can one day, but that's the gross way nature intended for our cats to eat haha I would definitely recommend! Perfect with Freeze Dried Raw! Thanks Tiki! My picky Persian is finally eating!! I had purchased the succulent chicken and was very impressed. It looked and smelled like canned chicken. Upon opening the Tiki after dark with chicken and duck, I was very disappointed. It was mostly liquid with just bits and pieces of meat. Two of my cats did like it but one did not. It was not worth the amount of the money spent and I will not purchase again. The cans are half full of water. Food smells bad. Cats would not go near it. I don't recommend it and will never purchase it again.